Content and photographs © 2009 Loyan Beausoleil and Gabe Kirchheimer. "Two days ago Camille asked me if a plane could hit our tower [apartment building]. I told her it was impossible for a pilot to make such a mistake. She said, 'yes it could happen, mean guys could do that.' I said, 'No, impossible,' and why would she think that? She was angry and told me that she didn't know." "Sorry I've been so worried about people. It's been hard since September 11th." 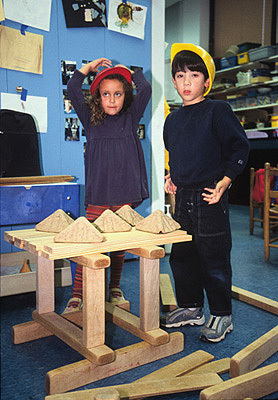 On October 4 and 5, 2003, children came to the classroom to design and construct what they would like to see built in place of the World Trade Center. 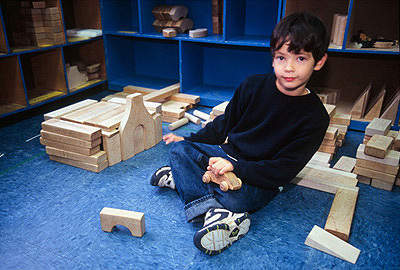 10/4/03  Camille, 6, building with Lucas, 6. 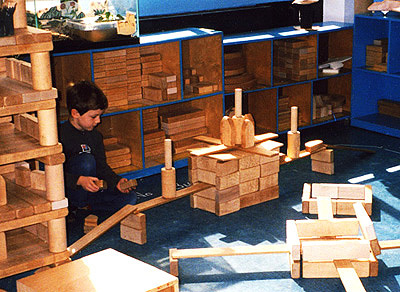 Lucas to Camille: "Your building is little." Camille: "I'm a little afraid if it falls down. 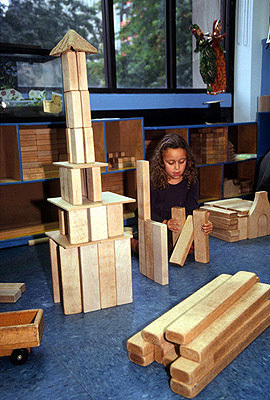 A real building could be very tall and it could break another house. So I don't like that." 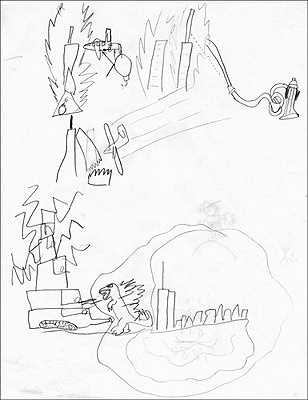 "I remember the Twin Towers and they got crashed down by bad guys. The police came and got them and the Army. I hope all the bad guys are gone." "This is the Twin Towers and over there is a regular building that was usually next to the Twin Towers. It used to be. This one crashed down because of an airplane got crashed into it." First Leo said that inside his building was a park named "The sad park"; a little while later he said, "The happy park, but they decided already. They decided they were going to build a building. 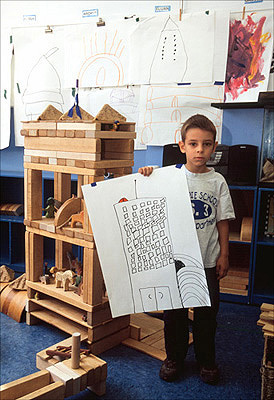 They will build something where the Twin Towers were but right next to that they will build a building so you can sit and meet other kids and think about the Twin Towers."